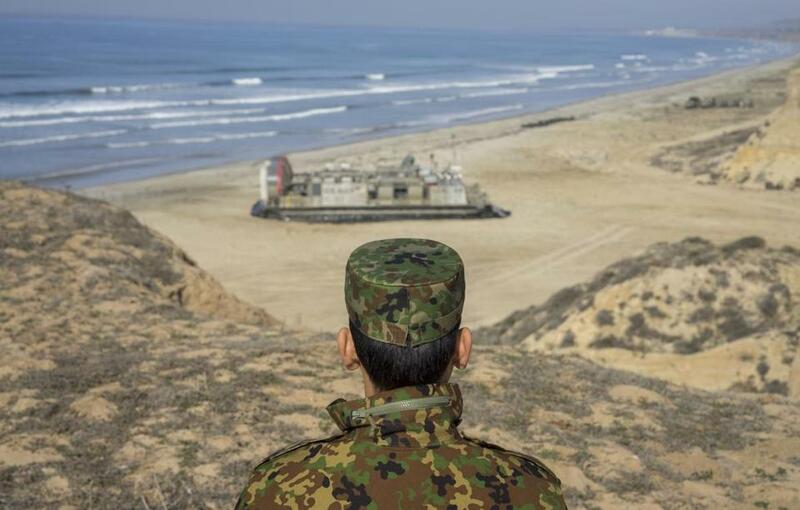 A Japanese officer watches as a Landing Craft Air Cushion transports US Marines and sailors and soldiers from Japan during a joint military exercise in California in 2014. When Americans look out at the world, we see a swarm of threats. China seems resurgent and ambitious. Russia is aggressive. Iran menaces our allies. Middle East nations we once relied on are collapsing in flames. Latin American leaders sound steadily more anti-Yankee. Terror groups capture territory and commit horrific atrocities. We fight Ebola with one hand while fending off Central American children with the other. In fact, this world of threats is an illusion. The United States has no potent enemies. We are not only safe, but safer than any big power has been in all of modern history. Geography is our greatest protector. Wide oceans separate us from potential aggressors. Our vast homeland is rich and productive. No other power on earth is blessed with this security. Our other asset is the weakness of potential rivals. It will be generations before China is able to pose a serious challenge to the United States — and there is little evidence it wishes to do so. Russia is weak and in deep economic trouble — not always a friendly neighbor but no threat to the United States. Heart-rending violence in the Middle East has no serious implication for American security. As for domestic terrorism, the risk for Americans is modest: You have more chance of being struck by lightning on your birthday than of dying in a terror attack. Promoting the image of a world full of enemies creates a “security psychosis” that misshapes our view of the world. It tempts us to interpret defensive steps taken by other countries as threatening. In extreme cases, it pushes us into wars aimed at preempting threats that do not actually exist. Arms manufacturers profit from the security psychosis even more directly than militarists. Americans take our staggeringly large defense budget almost for granted, and lament continuously that other countries do not build as many exotic weapons systems as we do. Finding new threats is always good business for someone. With the United State so dominant in global politics, it’s time to secure this low-threat world. Our strategic goal should be to keep our country as safe as it is now. That means bringing troublemaking countries out of their isolation. Ignoring their interests, or seeking “full-spectrum dominance” to assure that they cannot rise, provokes reactions that will be bad for us in the long run. Last year, after Russia began encouraging upheaval in Ukraine, NATO decided to “suspend all practical civilian and military cooperation” with Russia. Moments of crisis, however, are precisely the times when contact is most urgent. We took advantage of Russia when it was powerless a quarter-century ago. Future peace requires taking its security concerns seriously rather than treating the country as an enemy that is always seeking to best us. Our policy toward China is less aggressive, but beneath its surface is often a presumption that one day there must be a showdown between our two countries. The recent deal between Western nations and Iran is being sold as the taming of an enemy — although Iran is not our enemy. Neither is Cuba, despite the warnings of revanchists in Washington and elsewhere. Nor are most of the enemies-for-a-day that we eagerly seek, from Sandinistas in Nicaragua to Houthis in Yemen. I recently asked a United States Navy officer what threats he believed the United States might confront in the future. To my astonishment, he answered, “Venezuela.” The South American country is in political crisis and careening toward bankruptcy. Its combat navy counts six frigates and two submarines, none of them seaworthy. Yet last month President Obama designated Venezuela an “extraordinary threat to US national security.” The search for enemies can lead to odd places. This impulse is not peculiarly American. Feeling threatened strengthens group solidarity. Some thinkers have gone so far as to suggest that since societies become more united and resolute in the face of enemies, those that have none should find some. When Americans see threats everywhere, we fall into this trap. Believing we are besieged is strangely comforting. To recognize how safe we are would require a change of national mindset that we seem reluctant to make. Stephen Kinzer is a visiting fellow at the Watson Institute for International Studies at Brown University. Follow him on Twitter @stephenkinzer. • Michael K. Bohn: What solves a foreign-policy crisis?